Formulated to take out rust from pavers and slabs made of concrete. It effectively dissolves stains caused by rusted metal and fertilizer granules, etc. Since it contains no hydrochloric (muriatic) acid, it won't damage the pavers. 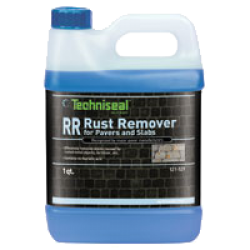 • Effectively removes stains caused by rusted metal objects, fertilizer, etc. 4) Rinse immediately with water. If rust persists, repeat the operation. Pavement with efflorescence (whitish salt) will appear spotted after the use of RUST REMOVER; for uniform results, finish by cleaning the entire surface with PAVER PRIMER or EFFLORESCENCE CLEANER. Rust streaks left by metal snowploughs may be difficult to remove. Do not use on natural stones or poured concrete.